I recently contributed an article to Business2Community and Yahoo Small Business Advisor on what to check before sending out your next email newsletter or promotional email. It was so popular and well-received that I wanted to re-post it here for my readers who may have missed it. In the fast and furious world of email marketing, it’s surprisingly easy to overlook an important element or error in your message, creating embarrassment and lost revenue opportunities for your business. Email is an extremely valuable and cost-effective tool to engage existing and potential customers. From subject lines to the email content itself, each aspect should be carefully considered and reviewed to ensure proper relevance, accuracy and style. Only then will you best represent your brand and generate the most impact. Forgetting to include the date of an event, missing a call to action, or even the dreaded typo can create a negative impression of your business and drastically reduce the effectiveness of your email. It’s happened to the best of us. A highly capable colleague of mine recently forgot a call to action – even with four other individuals checking over it! So, I prepared an email marketing checklist that you, too, can utilize before hitting the send button. Is the content interesting, valuable, and important to the reader? The fastest way to burn out your list and decrease the effectiveness is by sending emails for the sake of it; those that offer no clear benefit to the reader. Has your subscriber list been cleaned of unsubscribe requests or hard bounces since your last send? Are you using a From: name that is more recognizable and enticing than [email protected]? Is your subject line compelling and under 50 characters? Is your email scheduled to be sent out at a time/day where you tend to get a lot of activity? Are you sending the message out to your entire list, or just a segment of it? Is it going to the correct segment? Are you using words in the subject and/or body that raise red flags for spam checkers, such as Free, $$$ or CAPITAL LETTERS? If you have any dynamic, personalized fields, are they populating correctly? Is the most important information “above the fold” so readers can see it without scrolling down? Do your images within the email campaign have the correct alt text and title text to ensure that content can be read if images aren’t being displayed? Do you have clear calls to action as both graphics and text to ensure the reader clicks through to the page where you want them to go? Do you have any grammatical mistakes or typos? Especially if you wrote the content, these can be easy to miss so consider getting extra sets of eyes to check. Are you using trackable URLs on all of your links so you can track the performance of your email in your analytics? Is there an easy way to unsubscribe? Have you tested the email on various web browsers to ensure proper formatting and compatibility? Does your email render properly on mobile devices? After sending out your next email and following the checklist above, compare your deliverability rates, open rates and click-through rates with your previous emails and see if you can start tracking a difference. After a few times, these tasks will start to become automatic. However, it’s always a good idea to refer back to make sure you aren’t forgetting any. This email marketing checklist will increase the likelihood of your emails being received, read and acted upon, which puts you in a better position than a lot of your competition and will help you continue to grow your business. Have you ever sent out a marketing email and realized later that there was a mistake or issue? What did you do about it? Leave a comment below or let us know about any other tips to add to our email marketing checklist! How Can I Put Email Marketing to Work for Me Through Automation? As a company grows, maintaining a relationship with customers and leads without a scalable, automated system can quickly become an unmanageable task. 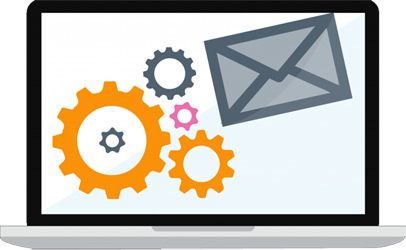 Email marketing automation lets you stay in touch with your customers, subscribers, and prospects, reaching them at just the right moments with the right messaging and helps build stronger relationships. Being able to deliver content that’s triggered by the behavior of your recipients drives more traffic to your website, increases engagement, and ultimately brings you higher sales conversions.